Due to the increased need for the UFC to provide on going pre hospital ems services to the community, the donation of an additional vehicle was provided to the department. This increased our departments capabilities to provide additional QRS services to the community. The department took delivery of a 1998 4x4 equipped Chevy Suburban which was generously donated by the Outten Auto Dealership in Hamburg,PA to the department in 2011/2012. 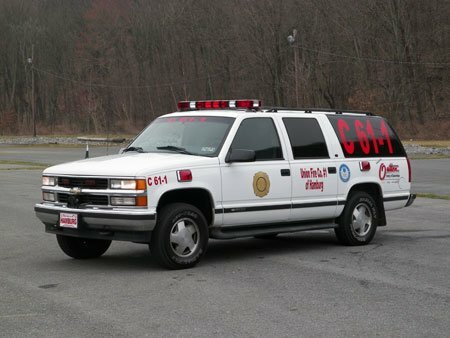 Car61-1 AKA” QRS Buggy 61” is equipped and certified as a QRS Vehicle with the PA Dept of Health. Car 61-1 can be utilized as a command vehicle if needed for mobile fire ground operations. 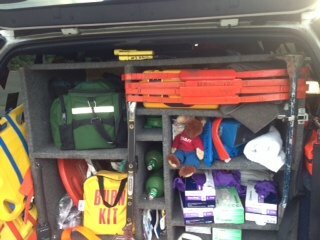 This vehicle provides primary QRS Services to Northern Berks and Southern Schuylkill County.